was surpassed by Dina Manfredini. in its capital city, Trento. World War I forced Pizzinato to take refuge in Bazzano, Bologna. and met her future husband Isidoro Papo. During the outbreak of World War two, in 1939, the couple moved to Nice, France, to escape the Fascist regime of Benito Mussolini. They married in France, and after the war, they moved back to Milan. settled. Mr. Papo died in 1981. The couple never had any children. her death, she lived in a retirement home there. people around the community Saint Catherine in Verona”. This entry was posted on May 13, 2012 by kterrl. 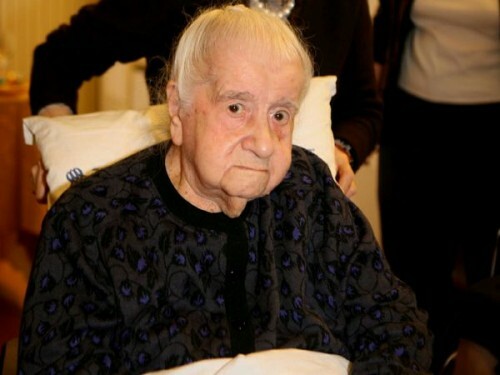 It was filed under Uncategorized and was tagged with Italian supercentenarian, oldest person in Europe and third-oldest living person in the world, stars that died, Venere Pizzinato, who died this year.